Wash and cut veggies making sure the pieces fit into your belnder, open cans, de-stem cilantro. 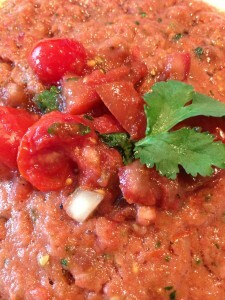 Pour Carmelina tomatoes into the blender and add all other fresh ingredients, except one tomato and the lentils. Carefully pour lentils into a separate serving bowl. Chop the extra tomato and any other ingredients to make it chunky and pour over the lentils. Taste adding salt and pepper as necessary. Tips: The salsa makes an excellent vegan sandwich, salad toping, or sauce for any protein. Try freshly cut vegetables, whole-wheat pita, and/or toasted wheat bread instead of chips. Hi I’m David! Please email me when you get a chance, I have a question about your blog!